It’s Baby Season – Let’s Get Sewing! So, is it just us, or does it seem like every quilter we know is working on projects for the newest additions in their lives? (Just yesterday one of our designers announced that she’s expecting a grandchild, and it goes on from there!) Blankets, bibs, stuffed toys, seat covers, changing pads and of course, cute outfits all make the list, and we just happen to have the perfect collection – SONGBOOK: Little Star is Laura Berringer’s (@laurasewmodern) lovely little flannel collection and it’s hitting quilt shops now! And since many of our quilting friends love to make their baby gifts extra special, we know you’ll appreciate the Little Star quilt free project – it’s available on the website. 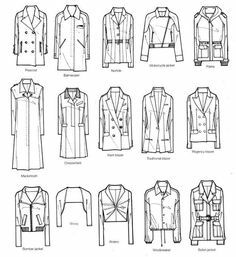 Mix and match the coordinates as you like. Congrats to all, and happy sewing! 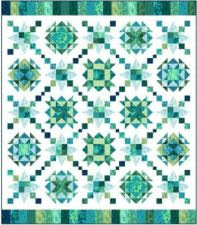 Ready to Join the Designer Duo Quilt-Along? The quilt is called “Kaleidoscope”, shown in Nancy Rink’s SEA GLASS (Left) and Sarah Maxwell’s BRING ON THE BUBBLY. In addition to their own renditions, they’ll share versions of quilts by a few of their quilt buddies in other fabrics as well. Get the complete details on Nancy’s blog, grab your pattern, choose your fabric, and join in the fun for 8 weeks, starting on April 6. And be sure to join the Facebook Group, too! During the show, you’ll find us in BOOTH 911, where you can pick up your postcard for our Booth Hop – there’s a $1500 Quilter’s Prize Pack at stake — just visit our participating sponsor booths at QuiltCon and follow the easy instructions to enter…just pick up this postcard at our booth to get started! Sponsors include our own Studio 37 designers, along with Aurifil, Olfa, Sizzix, and Private Source Quilting – thanks to all of you! When you hop over to Booth 530, you’ll see what’s new with Studio 37 designers Nancy Rink and Sarah J Maxwell. 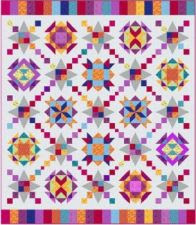 They’ll be previewing a fun new #designerduo Quilt-Along (it begins in April!) and Sarah will demo chenille techniques using her Primo Plaid Flannels and the Olfa Chenille cutter. There’s too much QuiltCon activity to share in just one blog post… stay tuned for Part II! Chenille Inspiration from Sarah J and Olfa – Enter to Win! Be sure to check out the Olfa Holidays Giveaway, running thru the month of December! 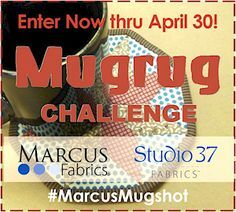 They’re offering 10 giveaways in all, including two chenille cutter prize packs, inspired by Sarah Maxwell of Designs by Sarah J. You could win an Olfa Chenille cutter, expertly designed to make quick work of this age-old fabric craft, plus a bundle of Sarah’s PRIMO PLAID FLANNELS: Color Crush II fat quarters! 3. Post a photo of what crafts you are working on this holiday season to either Instagram or Twitter with the #OLFAholidays tag OR enter on Facebook through the contest application form. 4. Be a legal resident of the United States of America (including its territories and possessions) or Canada (excluding Québec) and must be eighteen (18) years of age or older on the date of entry. This month we’re excited to welcome Kim Eichler-Messmer to the Studio 37 design team, with her gorgeous debut collection of batiks, entitled IMBUE. To imbue means to inspire or permeate with a feeling or quality; permeate, infuse, tincture, soak. This is how Kim likes to think about hand dyed fabrics. “They are infused not only with color and pattern, but with the intentions of the maker as well. These modern batiks were printed and dyed by hand in Indonesia and the designs came from my own hand dyed fabrics. The colors are rich and saturated and the slight imperfections in the print add character, movement, and a glimpse into the process of their creation” she explains. We love Kim’s creative philosophy, and the richness of her palettes. 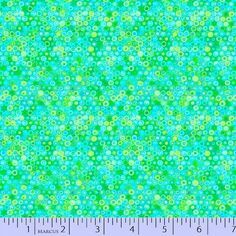 See all 22 designs online at Studio 37 Fabrics. Visit Kim online and follow her on Instagram @kimemquilts. If you’re attending, QuiltCon in Pasadena, CA, February 22-25, 2018, you’ll also have a chance to take her lectures and workshops and meet her in the Studio 37 Booth # 911. Laura’s Back, with Great Flannel Tips! We’re thrilled announce another wonderful video by Sew Very Easy’s Laura Coia! This time, she shares her best tips for working with our Primo Plaid Flannels, while recreating our free quilt pattern. From pre-treating your flannels to cutting tips and more, you’ll love how Laura goes about her creative projects. Thanks to Laura for another fun & easy sewing adventure, and Happy Flannel Sewing to all! If you haven’t subscribed to her YouTube channel yet, be sure to sign up to enjoy all of her great tips and tricks…Videos are posted each Tuesday & Thursday at 2:00 p.m. Feeling Lucky? Guess This Pumpkin’s Weight and Win!